Calming parents down is part of the job, too. 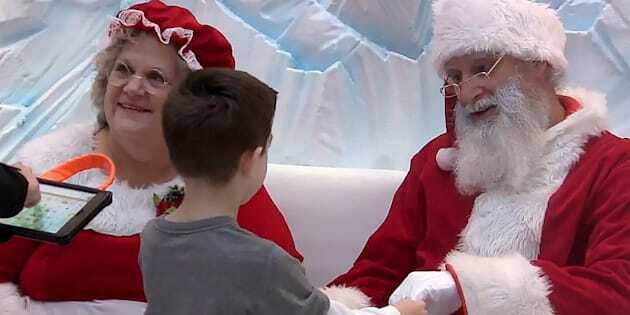 Tyson Lehr meets Santa, Robert Blais, and Mrs. Claus, Cheryl Agostino, while his mother Bethany Lehr looks on during a special "Silent Santa" session for children with autism at Londonderry Mall, in Edmonton, in this still image made from video on Dec. 17. There was no Christmas music playing and it was early on a Sunday morning, so the stores were closed, meaning there wasn't the usual crush of holiday shoppers. The special session, called "Silent Santa,'' was all meant to avoid distracting sights, sounds and even smells that can be a problem for children on the autism spectrum. "My dress is sparkly and pretty and people compliment about it. I really like it when people compliment about it,'' said Kalen, who is seven and has Asperger's Syndrome. Her mother, Karina Hernandez, explained that since they didn't have to worry about upsetting distractions, the family could take the extra time for their daughter to dress up for her special meeting with the man in the red suit. Kalen, who smiled the whole time, said she wasn't nervous at all. "'Cause I was so excited!'' she explained. Robert Blais, who is the mall's regular Santa, said he usually jingles bells, but for Silent Santa keeping things calm is the best way to keep everyone in the Christmas spirit. Blais explained that calming parents down is part of the job, too. "You rub their backs and you just say, 'It's OK, mum and dad. Just relax. It's all good,'' said Blais, who performs Santa along with his spouse, Cheryl Agostino, who does Mrs. Claus. Appointments with Santa were booked in advance, so there was no lineup, which can also be difficult for an autistic child. Tyson Lehr meets Santa, Robert Blais, and Mrs. Claus, Cheryl Agostino, while his mother Bethany Lehr looks on during a special "Silent Santa" session for children with autism at Londonderry Mall, in Edmonton, on Dec. 17. Bethany Lehr, who brought her son Tyson, said they've tried going to a regular Santa, but they had to get there as soon as the mall opened. Even then it was a challenge. "My son has a hard time waiting in long lines so this program is really helpful because we can book an appointment and he doesn't have to wait very long. And he can get a little extra time and be a little more wiggly than other kids so that really helps,'' Lehr said. Adam Kedmy, an advocate with Autism Edmonton who is himself on the spectrum, staffed a table with toys such as fidget spinners for the children to focus on in case they were needed. "Seeing these kids get to experience Santa in a way that's comfortable for them is really exciting for me,'' Kedmy said.